Set in Alliance in the Ohio Region, 34 km from Kent, Hampton Inn & Suites-Alliance, OH features a fitness centre and indoor pool. Each room includes a flat-screen TV. You will find a 24-hour front desk at the property. Canton is 24 km from Hampton Inn & Suites-Alliance, OH, while Aurora is 49 km from the property. The nearest airport is Akron-Canton Regional Airport, 26 km from Hampton Inn & Suites-Alliance, OH. Set in Alliance in the Ohio Region, 34 km from Kent, Hampton Inn & Suites-Alliance, OH features a fitness centre and indoor pool. Guests can enjoy the on-site restaurant. Each room includes a flat-screen TV. You will find a 24-hour front desk at the property. Canton is 24 km from Hampton Inn & Suites-Alliance, OH, while Aurora is 49 km from the property. The nearest airport is Akron-Canton Regional Airport, 26 km from Hampton Inn & Suites-Alliance, OH. Guests are required to show a photo identification and credit card upon check-in. Please note that all Special Requests are subject to availability and additional charges may apply. 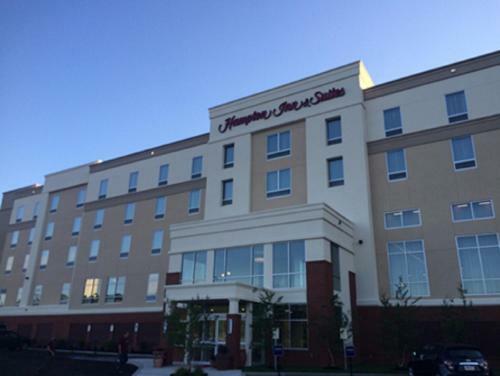 the hotel Hampton Inn & Suites-Alliance, OH so we can give you detailed rates for the rooms in the desired period.